I know, most of you have been eating smores since you were wee, and you love the way that marshmallows melt into creamy hot chocolate, but just these two together–graham cracker unnecessary–are the new Kate and William of the dessert repertoire. 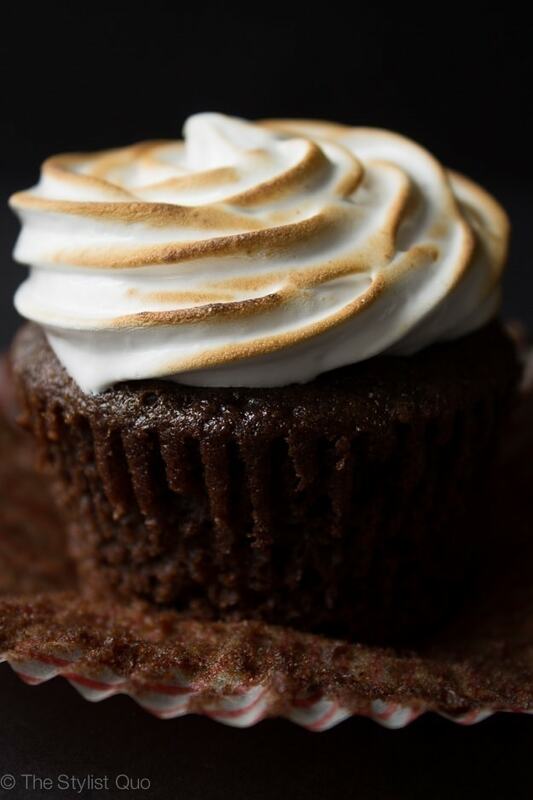 A rich, slightly spiced chocolate cupcake with a moist crumb topped with a sticky marshmallow frosting is perfect, the fluffy white goo balancing out the heady chocolate. But when you break out the kitchen torch and brûlée the piped edges, the pairing is taken to another level. 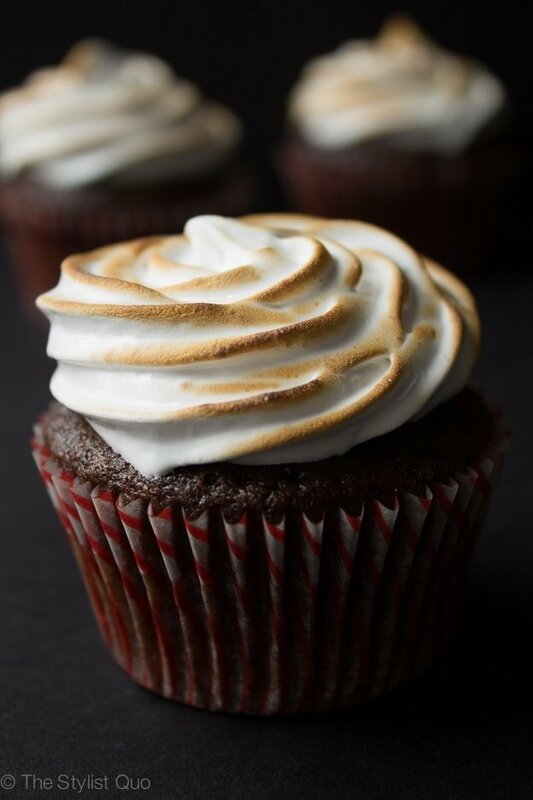 The crispy shell, perfectly browned to an elegant hue, the mere hint of a smokiness that lightens the marshmallow sweetness just enough – it’s a must. 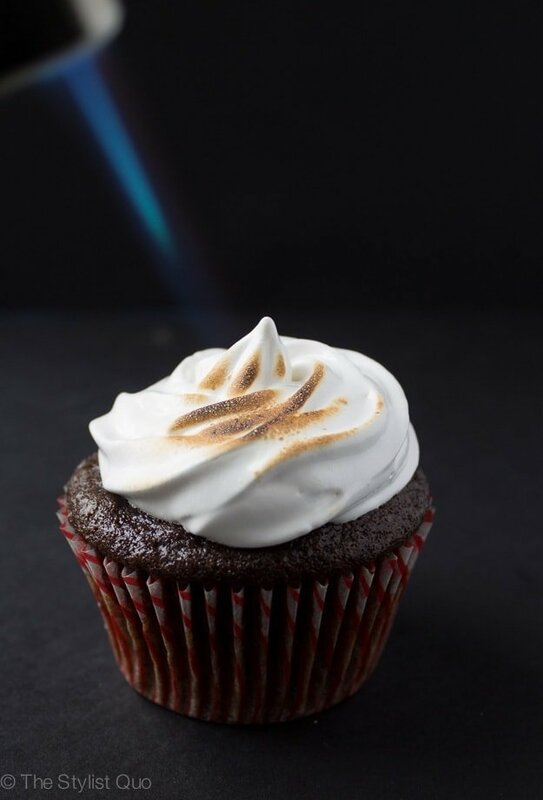 Toast the edges lightly with a kitchen torch, being careful not to stay on any one section for long, lest you end up with blackened marshmallow frosting! Have you ever gone to make frosting and realized you’ve got, what, 14 pounds of granulated sugar on hand, but no powdered sugar? Or.. is that just me? Either way, this marshmallow frosting recipe makes use of a few eggs whites and some white sugar, ingredients you probably always have on hand. I love that I don’t have to coat the counter in a dusting of powdered sugar for this recipe, and there’s nothing more satisfying than beating simple eggs whites into a luxurious, airy cream with an almost otherworldly gloss. 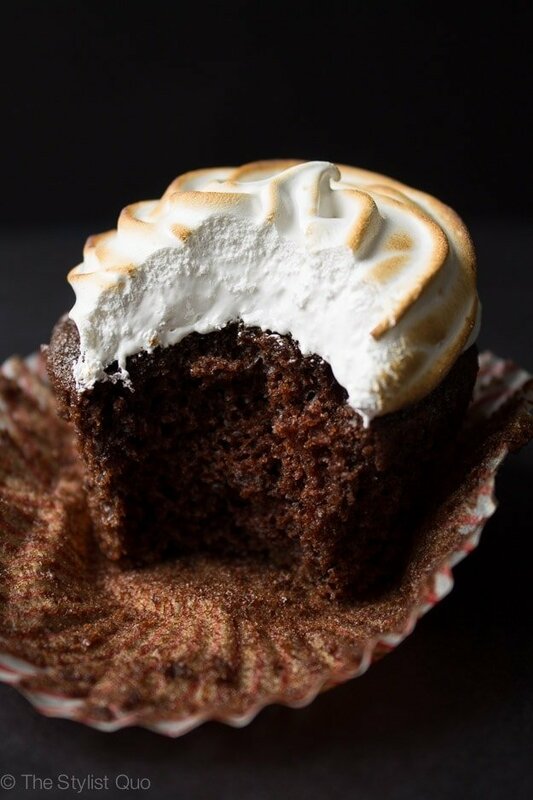 I added a bit of cinnamon to my favorite chocolate cupcake batter to bring out the chocolatiness and a suggestion of a steaming cup of hot cocoa. I piped the quick and super easy marshmallow frosting with a star tip and then chilled them in the fridge to encourage the frosting to keep its shape beautifully. 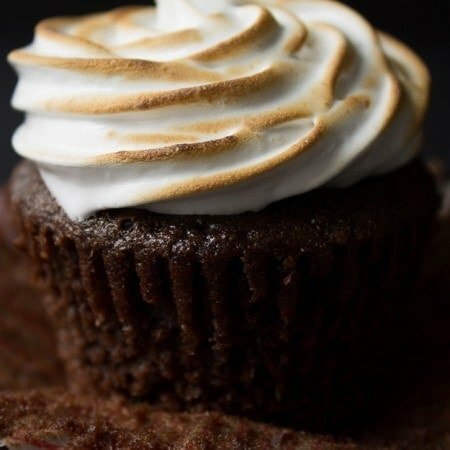 A hot chocolate-inspired creation with a moist, rich chocolate cake, fortified with a bit of warming cinnamon, balanced by a swirl of fluffy marshmallow frosting, toasted to elegant perfection. Whisk together the almond milk or milk and vinegar in a large bowl, and set aside for a few minutes to curdle. Regular milk will not curdle as clearly but it will still be fine! Then add the sugar, oil, and vanilla extract to the vinegar mixture and beat until foamy. In a separate bowl, sift together the flour, cocoa powder, baking soda, baking powder, cinnamon and salt. Add in two batches to wet ingredients and beat until no large lumps remain (a few tiny lumps are OK). Meanwhile.. Fill a medium saucepan with 1 inch of water and bring it to a simmer over medium heat. Place the egg whites, sugar, cream of tartar, and salt in the clean bowl of a stand mixer and whisk by hand to combine. Nest the bowl over the saucepan, making sure the bottom of the bowl is not touching the water. Heat the egg white mixture, whisking constantly, until the sugar has dissolved and the mixture is hot to the touch (about 120°F on an instant-read thermometer), about 6 minutes. Pipe onto the cupcakes using a medium star tip. Chill (optional) for at least 30 minutes to set the frosting a bit, then use a kitchen torch to lightly brûlée the edges. Previous Post: « You’re Engaged! Now What? The frosting turned out beautiful!! I’m thrilled with the results. The only tweaks I made was using vanilla salt and a small amount of vanilla bean paste. Thank you for posting a simple and wonderful recipe. I don’t see the recipe for these, I have made these before and I should have printed the recipe because it was AMAZING, if it can be posted again that would make me SUPER HAPPY! Uh oh! So sorry. Technical difficulties over here! When we merged blogs, about half of our recipes stayed behind in some interwebbed wormhole. I’ve updated now.. try again! Thanks so much for letting me know, Jen, and for loving this recipe! Can you sub almond milk or coconut milk? Oh. My. Gosh. Yum. Yum. Yum. Yum. Yum! O I love toasted marshmallow frosting! Yum yum! Happy New Year Cheryl! Happy New Year Christina! I love it now too 🙂 Such an elegant presentation for being so dern easy! You are so right. Chocolate and marshmallow is the best combination ever! Since it’s currently blizzarding outside, these would be perfect! And no need to face the milk-and-bread-crazed hordes at the store for powdered sugar, as long as you have good old-fashioned granulated on hand! Is it just me or do I NEVER have enough powdered sugar at my house? !